Following on from last weeks post about our recent CWAC (Coordinated Water Bird Count) here in South Africa, one of the most abundant birds counted was the 'African Darter' (Anhinga rufa). Found in almost all bodies of water in Sub-Saharan Africa, this much-maligned bird is also known as the 'Snakebird' due to its long slender head and neck which is often the only part of its body seen when it is swimming along the surface of the water. One of my favourite photographs from last year (see below) was taken of the African Darter which I captured at first light in one of the worlds famous wildlife and nature reserves situated here in South Africa the Kruger National Park. 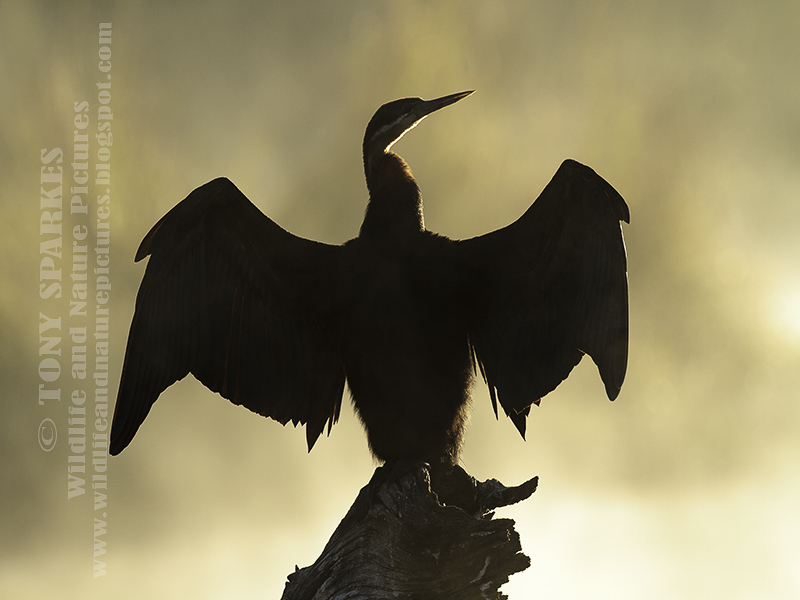 Exposing for the 'golden' early morning light that was in front of me and as the morning sun rose I caught this African Darter in a great backlit 'silhouette' pose shortly after it had been fishing for its breakfast. This 'classical' pose denotes the reason why the African Darters is more often than not seen like this. The African Darter lacks 'oils' in its feathers therefore their feathers are not 'waterproof' and become waterlogged when swimming and or diving for food. Unlike many other water birds who's feathers have the necessary oils to keep their feathers suitably protected. Therefore the African Darter simply has to 'dry' their feathers out in the sunshine and or wind before they can fly again. I have also been told that this 'pose' also aids digestion once the African Darter has eaten, which is generally molluscs and of course fish.